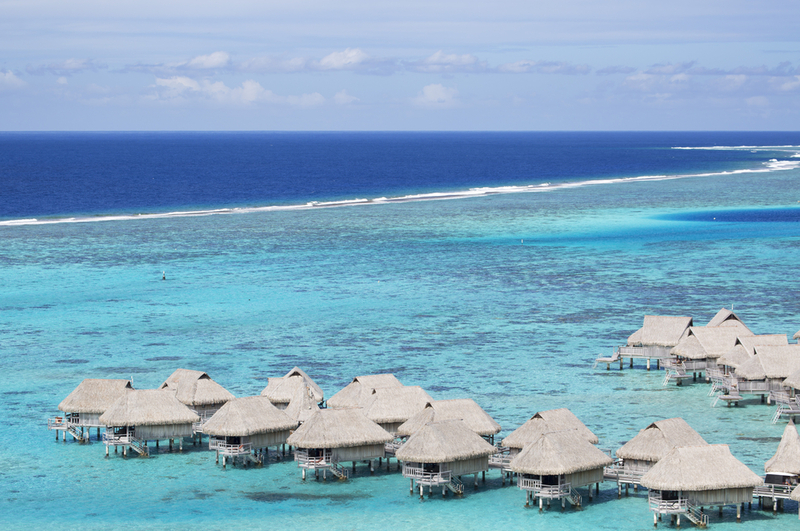 The Islands of Tahiti and overwater bungalows are as synonymous as sun and sand; after all, the concept of luxurious “huts” on the water was born here. It’s hard to imagine a trip to these islands that doesn’t include a stay in the bungalows, and it’s definitely an experience you’ll find on most wanderlists. We searched the islands for the best resorts offering over-the-top sanctuaries above the bluest water you’ll ever see. The island of Bora Bora is no stranger to world-class resorts with five-star accommodations —there are so many to choose from. 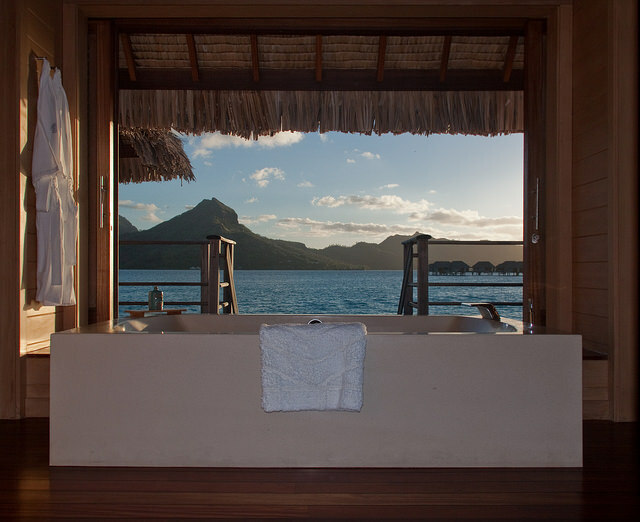 But the St. Regis Resort Bora Bora really stepped up their bungalow game. Overwater Villas feature enchanting lagoon views, Italian marble bathrooms, private waterside balconies, and glass panes in the floor that peer into the water below. However, what really sets them a step above the rest are their two-bedroom Royal Overwater Villas. These mansions at sea feature two bedrooms, two baths, and an outdoor terrace with a private infinity pool suspended over the cerulean sea. If that doesn’t float your boat, maybe your complimentary butler can arrange an in-suite massage or a day trip to one of their private islands. With everything at your beck and call, there is no need to leave your home away from home. 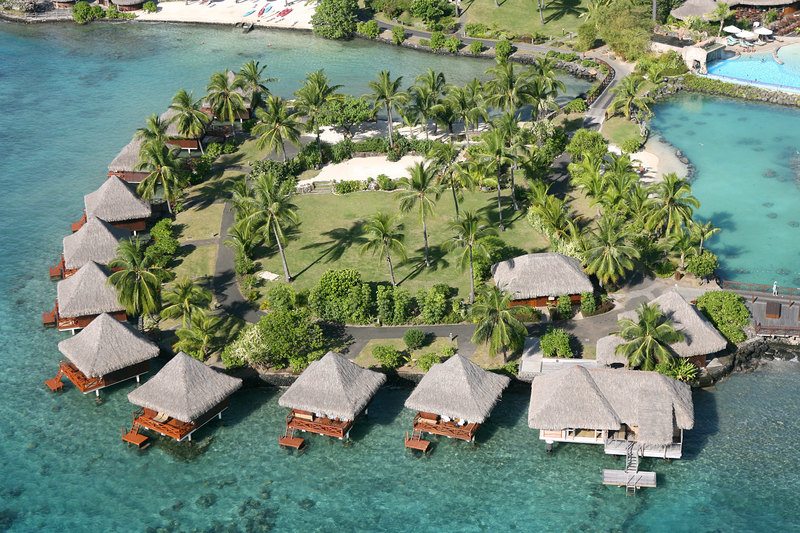 One of the first resorts on the island of Moorea to offer overwater accommodations, Sofitel Ia Ora has perfected this one-of-a-kind experience. Their Superior and Luxury Overwater Bungalows have glass viewing panels built into the floor and direct access into the lagoon for when you want to join your new fishy friends. To truly connect you to nature, their Luxury bungalows, the largest on the island, have unparalleled views of the water and the silhouette of Tahiti in the distance thanks to floor-to-ceiling windows in your solarium. The island of Taha’a’s secluded location is as sweet as the vanilla that grows there. Also a popular spot for Tahitian black pearls, this small island has worked hard to stay true to its Polynesian roots, and that adds to its charm —you can truly disconnect from the world here. All Le Taha’a Resort’s Overwater Suites are the same size and have the same fantastic amenities. Spacious bathrooms contain a separate shower and bathtub for a relaxing soak before dinner after a day of swimming in the lagoon from your private sun deck. The epic views are the real stars of the show. Watch the colors dance on the water from your Sunset Suite, admire the silhouette of the neighbor island off in the distance from a Bora Bora Suite, or feel the intimacy as the open ocean stretches for miles from your End of the Pontoon Suite. 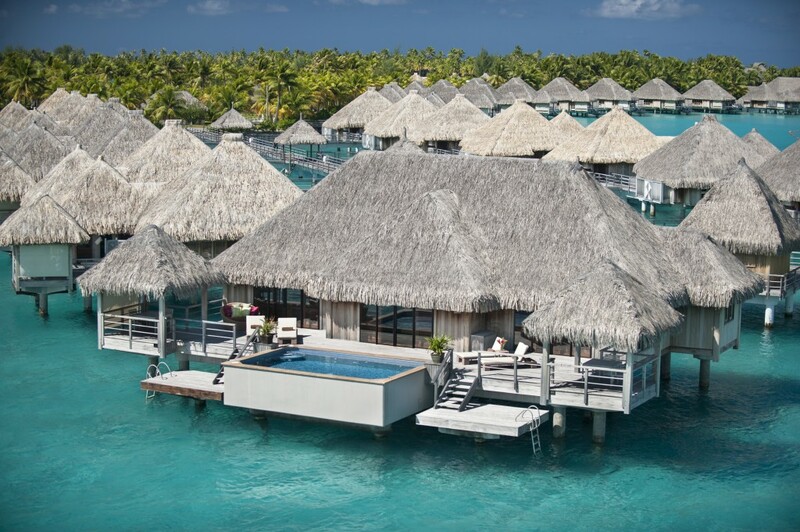 Luxury is a term that barely scratches the surface when describing this resort and their overwater bungalows on the famous Bora Bora. For an extravagant retreat worthy of the number one island in the world, stay at the Four Seasons Resort. 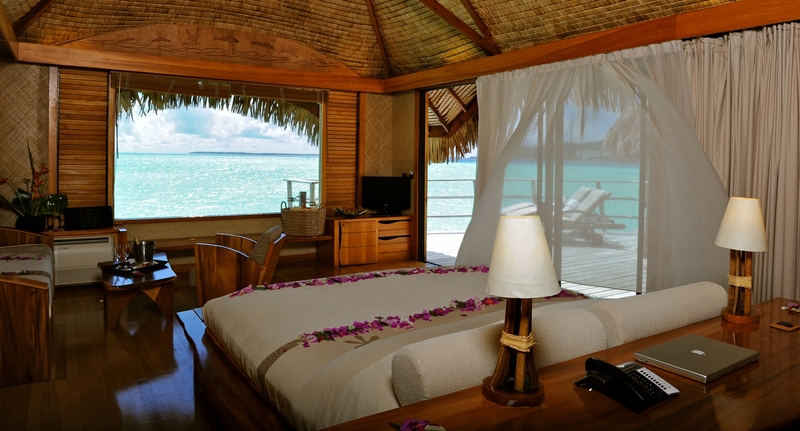 And don’t stay in just any overwater bungalow, stay in their Specialty Overwater Bungalow Suites with Plunge Pools. Choose from one- or two-bedroom suites to accommodate couples or the entire family. Thanks to large sliding doors, views of the Pacific are plentiful throughout the bungalow, but the best views are definitely seen from the soaking tub, where the bathroom provides you with panoramic views with floor to ceiling glass panels, including one built into the floor. The large deck stretches the complete length of the suite and ends with a refreshing and private plunge pool right outside your bedroom door. Whether escaping to the sheltered shores of Taha’a or the beautiful beaches of Bora Bora, your journey to the Islands of Tahiti is not complete without a stay in an iconic overwater bungalow. Book now with your local travel agent, who will find the villa with your name on it and make your Tahitian dream vacation come true.